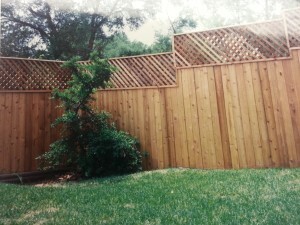 If you’re looking for the best Austin Fence Repair company, you have come to the right place. Especially for wood fences. All of our fences are custom made, piece by piece! We do Not use “pre Fab Panels”. Our fence gates are always double posted, meaning there are two posts on each side of the gate for strength. We provide the maximum support on each gate. This design helps in the longevity of your new gate! It keeps the gate from “sagging/dragging” that many gates get overtime w/ usage. Since our founding Austin fence reviews are something we take seriously. When doing fence repairs we don’t cut corners and we repair your fence the way we would want ours repaired. Gate dragging, posts leaning, broken boards, coming loose. Not ready to replace old fence? Trying to get a few more months out of the life of your fence? We can make the necessary repairs to do that. We specialize in gate repairs, pickets replaced, wood post replacement, steel post straightening. Call today for an evaluation of your fence. We will test the strength and Integrity of it, and let you know what needs to be done. Our fence staining provides maximum UV protection, prevents water damage, Fungus and Mildew resistant, and extends the life of the wood. There are several beautiful colors to choose from. Want to open up your backyard and utilize all of its space? We install all types of Automatic Gates. Wood, Wrought Iron, Swing or Slide Gates. Automatic gates options include: a battery back up, a safety eye, and two remotes. We can also program the operator to your homelink in your automobile, or to an existing garage door remote. We also install chain link fencing. This is a galvanized wire mesh fence. It comes in all sizes and also comes in black vinyl coated.